The world of Republican government IT solutions is changing as dramatically as the Party itself. The November 2008 rout of Republicans followed eight years of ever-expanding mismanagement of the Bush White House. Few would have imagined the global magnitude of its fallout but trendsetters at two very competent top-tier GOP tech companies led the political technology market's new wave of consolidation by merging GovTech Solutions, L.L.C. (Richfield, Ohio) and GSL Solutions, Inc. (Tampa, Florida) just a month earlier. Already powerful among the GOP's network insiders, GovTech visionary Mike Connell was ready to rule when the newly minted HillTop Content Management System (CMS) would "create a dominating force on Capitol Hill". But a horrible year for Republicans turned into Connell family tragedy when HillTop lost its architect and the GOP's Internet pioneer in a December 19 aviation accident. The crash of Michael Connell's single-engine Piper last Friday leaves a somber Christmas season ahead for his wife and four children and ends the career of an information technology pioneer. Connell's expertise drove the Republican Party onto the infotech highway of the Internet era in time to seat the most famous of his three Bush clients in the country's top office. His death should mark the beginning of a thorough examination of his political role inside the technology infrastructures that elected and that supported an Administration so widely recognized for politicizing the machine of Federal governance and justice. For the Bush dynasty's RNC, Connell embodied a paraphrase of his favorite place -- he ~was~ the cutting-edge, not just at it. His partnership with the Party and its most powerful operatives (now known as DCI Group among other names) gave its political and corporate leaders the Internet edition of mass communication 'astroturfing' tools by which to engineer the consent of the public. Mike Connell, 45, died in a plane crash in Ohio last night. 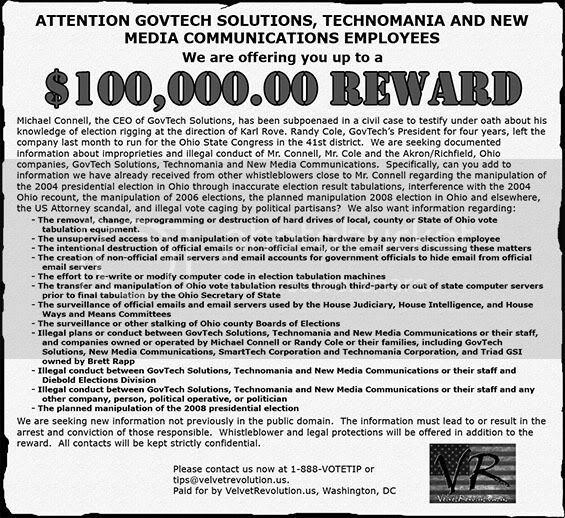 You may recognize his name -- he was the president of New Media Communications and GovTech Solutions whose one-side-of-the-aisle clients he serviced on both sides of the government firewall. In concert with SmartTech Corp. and former Ohio Secretary of State J. Kenneth Blackwell (now aspiring to the national GOP Chair), his concurrent architecture of Ohio elections and GeorgeWBush.com moved ePluribusMedia researchers on Election Night 2006 to place Connell's companies on the blurry map of outsourced political governance. Make the jump for a more complete list. Any oversight by Office of Federal Housing Enterprise Oversight - www.ofheo.gov? Bumped. -- GH Originally posted 2008-09-07 13:11:07 -0500. --- Ever since I've known of this office, I've wondered if they have actually done any oversight of Fannie Mae and Freddie Mac. What do they do? And how'd Mike Connell get the job of running their website back in 1999? Does George W. Bush get some sort of inside information from this arrangement? Read more about Any oversight by Office of Federal Housing Enterprise Oversight - www.ofheo.gov?